If you're looking for high quality professional services for apartment complexes and commercial buildings, you've come to the right place. A & C Property Services is fully Insured and an Accredited Member of the Better Business Bureau. A & C Property Services has been serving Monroe County and surrounding areas since 1985. We offer the best property service solutions and provide affordable, prompt, reliable professional painting, carpet cleaning, floor stripping and waxing between tenants or just as a regular maintenance service for your rental properties. Our rates are competitive, and we provide FREE ESTIMATES. Our employees are friendly and professional. A & C Property Services is located in West Henrietta, NY and has been providing affordable and professional services in Rochester and surrounding areas since 1985. Let A & C Property Services Put Our Experience to Work For You! You choose the colors, we do the rest! Tenants leave dirty carpets behind? We'll take care of that too! realtors, contractors & individuals with their property service needs. Why try to do in-house painting when you can have a professional company take all that stress away? A & C Property Services specializes in vacant apartment painting with the same colors or new ones. We are experienced with smoke and fire units and will apply the correct primer before painting. Quick turnovers and frequent schedule changes are what we are used to. Drywall repairs will be done to your specs if needed. We know how to keep costs low and provide a quality job. Sinks, bath and floors will be paint free when we finish. We use hot water extraction method and have portable units for hi-rise work. Rotary brush shampoo is available for commercial carpets. Refinishing VCT floors is affordable. Floor waxing will protect and make them look new again. Full strip & wax will take all layers off to the bare tile for heavily worn floors and requires at least 2 coats of finish. 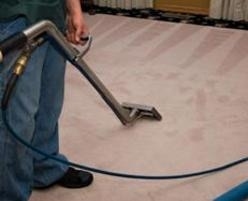 Scrub & recoat is done when minor scuffs are the only problem and is a less expensive option usually requiring 1 coat of finish. High-speed buffing is available for that extra shine.